*Note - These review samples were provided by Mike from https://novelkeys.xyz/ for free. That being said, this review is wholly independent, unrequested by Mike, and contains my own truthful opinions. I received these switches and was keen to try them out asap. For this review I’ve used them in an Alu 60% plate, with a HS60v2, in an alu 60% case. The switches have not been lubed, and I’ve been using them for work over an 8 hour period. I do intend to come back and update once I’ve had more time typing on these. These switches have a lightly smoked appearance. The leaf and internals are visible, bit through a tinted plastic. Aesthetically this seems divisive - I really like the look, whilst a few friends have not. The black stems sit well with the tinted housings, and live up to the ‘Ink’ in the name. The housing fully resembles, and also has the same markings of a standard Gateron switch. The logo is fully present, and the same diode and even same mould reference markings are on the bottom. The stems are also identical to a standard black Gateron stem. These are a linear switch, and feel very similar to the SMD Gateron housings. The switches were pretty smooth to begin with, although there was a slight scrape feeling at the bottom of the press. Over a few hours that has gradually changed - especially on the most used switches, so I do believe these will benefit from breaking in. The spring has no crunch to it - except close to bottom out on a small number of keys. Again this has improved over the course of the day’s use. I suspect both the spring and the scratch could be fixed by an application of a lubricant -I have not tested this as yet, but will prior to completing a full build. There is the standard Gateron amount of ping though. Compared to other switches, these are smoother than milky bottom Gaterons and slightly smoother than a stock re-tooled black Cherry switch, but its a fine line of differentiation. Tealios are still smoother, but again this difference is marginal. 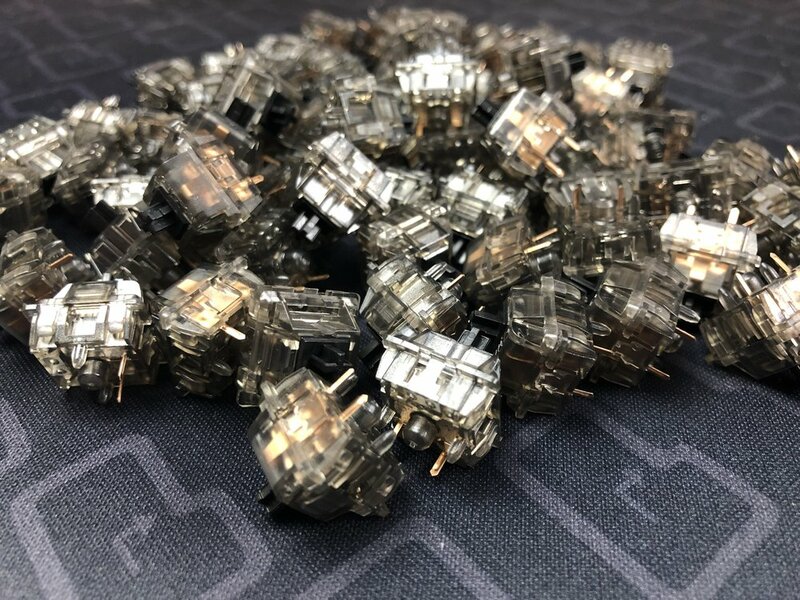 The wobble on these switches is in line with the rest of the Gateron range - and this is borne out by it appearing they are using the same moulds. These have a ‘Clacky’ sound to them, similar to other clear housing switches such as a Tealio. It’s quite a ‘poppy’ sound and is, I feel, a truer note. Of course, plate material, case material and design and other factors can all affect sound as we are aware. This is a much more pure sound than the black or milky based Gateron switches can be, and closer to a Tealio’s sound profile if not a fraction more resonant. These are very pretty smooth switches, that have significantly improved in a short period of time. Lube will undoubtedly add an extra factor to this - and I I’m looking forwards to a build that will let me try that out. The look will be decisive, but these do fit my tastes as an alternative linear. The smoky appearance is noticeable, but not so dark as the KBDfans T1’s smoky housing. The black stems look great, and they really fit the ‘ink’ theme. In terms of my personal opinion, I still prefer other linears, but I suspect once lubed this will be up there with my Tangerines and Vintage and Re-tooled MX Cherry black switches. The sound profile is adequate, the feel smooth and the wobble within levels of acceptability. Alternatives are smoother (Tealios) or offer less wobble or a better sound profile (Retooled Cherry blacks); but right now, given the expected price and looks, I’ll definitely consider these for future builds.